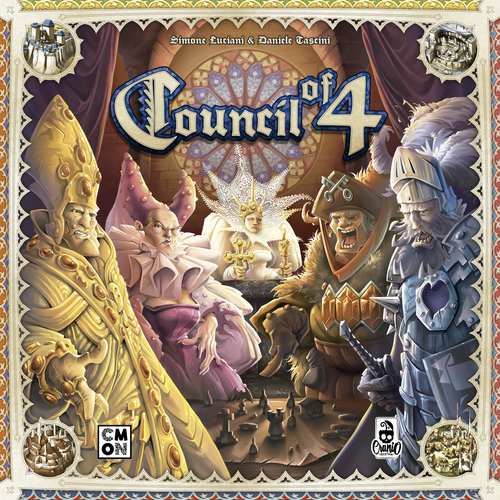 Hot off the presses is Council Of 4 designed by the same dynamic duo Simone Luciani & Daniele Tascini who did Tzolk'in. In Council Of 4 it pays to lend a hand. Help members of the 6 great families onto council seats across the empire and persuade these wise councilors to return the favor. 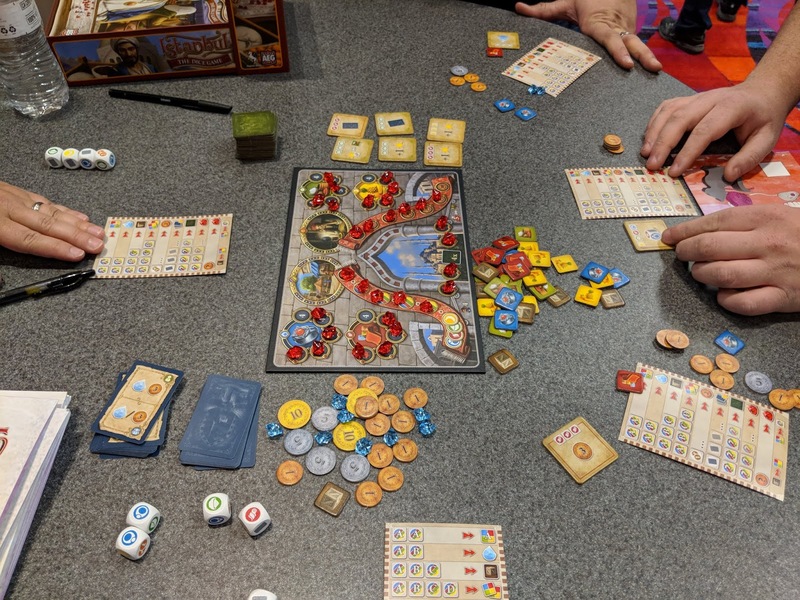 You will elect councilors, buy business permits, and connect your cities to reap rewards. 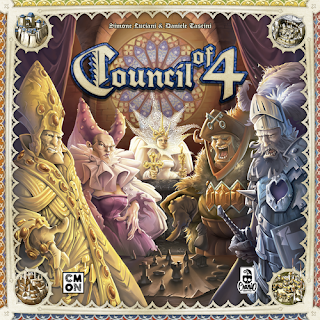 We have an open copy of Council Of 4 for you to come in and play. Additionally, come to our special demo session on Saturday, June 9th to learn more about the game. Another new game from CMON is Dragon Castle, a abstract til game inspired by the traditional Chinese game, Mahjong. Pick pairs of identical tiles from the crumbling Dragon Castle and use them to build your own realm board. Create sets of tiles of the same type and build Shrines on top of them to score points. 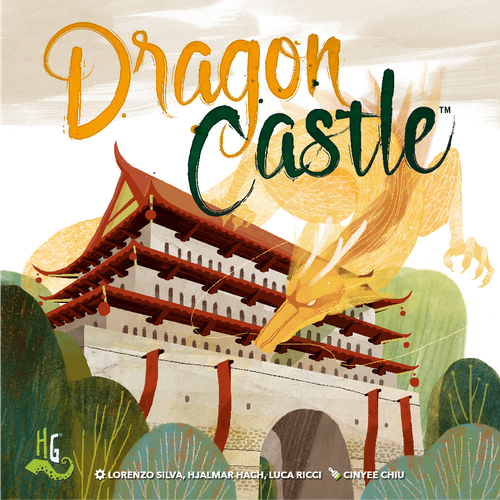 A randomly selected Dragon bonus objective card and a randomly selected Spirit special ability card will be placed next to the Dragon Castle visible to all players. Once per turn, players may use the special ability indicated on the Spirit card. 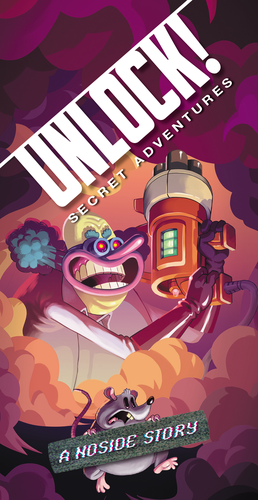 To activate and use the special ability on the Spirit card, a player must either discard one of their face up tiles or one of their unused shrines. End of game bonus points are awarded to those who have met the requirement on the Dragon bonus objective card. New from AEG is Istanbul: The Dice Game, a stand-alone game for 2 to 4 players that plays in 30 minutes. 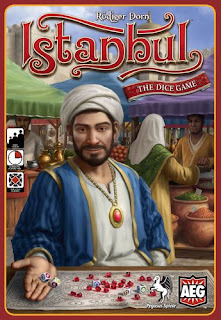 Players are traders in the Istanbul bazaar with the goal of being the first to acquire 6 rubies. They will need money and goods to purchase rubies and for those they must depend on their assistants, who are represented by the dice. 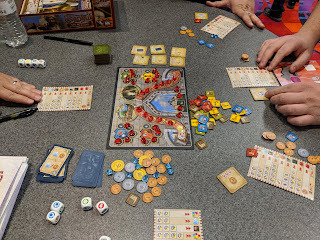 The 6 icons on these dice indicate what your assistants can procure (bazaar cards, Lira, cloth, fruit, spices, and jewelry). Each turn a player will send out his/her assistants by rolling 5 dice. 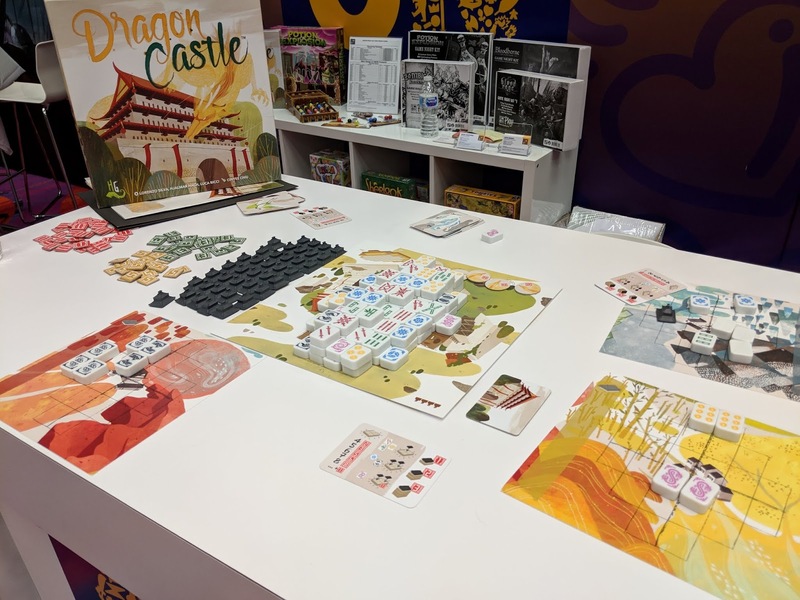 With the resulting icons and any previously stored Goods Markers, the player will carry out 2 actions such as collecting and storing resources or acquiring Bazaar cards or Mosque tiles to provide additional benefits. 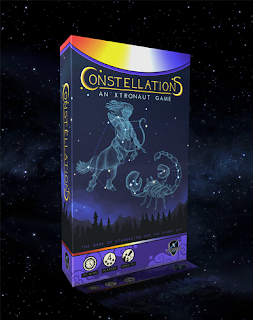 Become a stargazer in Constellations a card game for 2 to 4 players and 2018 Mensa Select Award winner. In Constellations, players are stargazers, exploring the night sky and collecting stars to define constellations. They compete to find the right stars to fit the needed pattern -- are B-type stars or F-types required to complete the constellation? Players compete with each other to strategically collect the right stars, reserve patches of the sky for observation, and explore the universe. Once you have your constellation, add it to the map of the night sky being assembled right in front of you. The closer you get to putting together the actual map of the heavens, the more points you score! Constellations also includes an educational workbook about stellar evolution, star classification information, and the history and mythology of the real constellations. 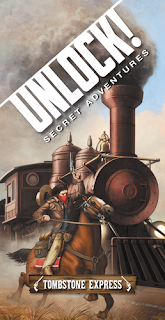 Two new Unlock Secret Adventures - experience the trills of escape rooms without leaving the table. Search the scenes - combine objects - solve puzzles. Tombstone Express - This train transports a precious package and you have a hunch that this trip will hardly be useful. A Noside Story - A thick smoke lingers over the region. Another dirty trick of Noside? Stop him before it's too late. 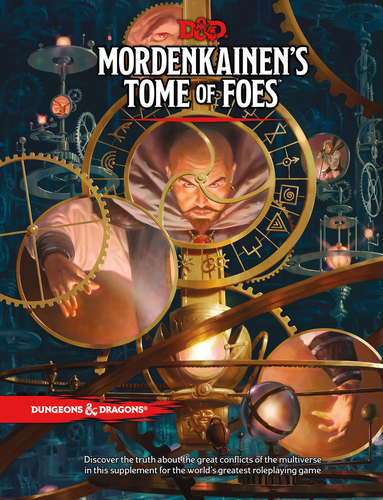 Mordenkainen's Tome Of Foes is the latest book supplement for D&D Fifth Edition RPG. Discover the truth about the great conflicts of the multiverse in this supplement. In addition the book contains game statistics for dozens of monsters: new demons and devils, several varieties of elves and duergar, and a vast array of other creatures from throughout the planes of existence.